2016 was the year for the implementation of projects aimed at offering a total shopping experience to DIA’s more than 40 million customers. The development and exploitation of the benefits of digitalization in a broad sense has taken up a large part of the company’s efforts during the financial year, in order to adapt it quickly and efficiently to changing consumer habits and to enhance listening and relationship channels. Satisfying customer needs has been a constant in the more than 35 years of activity of the DIA Group. The new digital tools and the opportunities offered by the new environment have been used by the company to further develop its two-way relationship with its customers, offering a more complete shopping experience. In keeping with the strategy of increased closeness to the customer, the last financial year saw the implementation in Spain of a new listening system that aims to gain first-hand knowledge of the customers’ shopping experience, both in the offline and online channels. Accordingly, customers who use the Club DIA loyalty card to make a purchase in one of the group’s stores receive an email with a brief questionnaire that evaluates the service received from the store employees, as well as their final experience at the cash registers. During 2016, the company has made progress in the implementation of its system of direct listening in group stores, sending out more than nine million questionnaires and obtaining a response rate of 7%. This system provides DIA with information that is used to develop initiatives related to service and efficiency improvements. Online customers have also received these questionnaires, and the objective is the same: a continuous improvement of the customer experience. The company conducts a satisfaction survey, under the name of Opinators, in order to gain knowledge of the experience and sensations of users of the company’s online service in Spain. Following their first order, each customer is sent a questionnaire after the order has been received at home, and at the end of the year, another questionnaire is sent out for a general evaluation of the service, attention and other parameters relating to the online shopping experience. In 2016, more than 90,000 questionnaires were sent out. In keeping with the commitment to internationalization of any project implemented by the company, in 2016 development began on a listening system in Argentina under the name of “Mi experiencia DIA”. 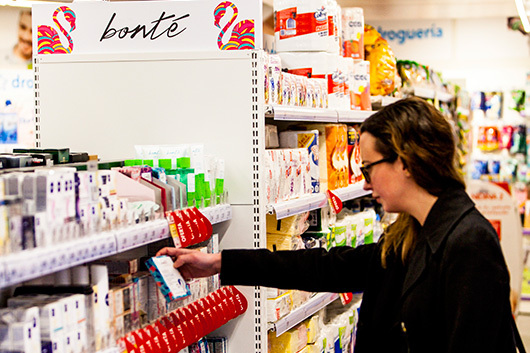 Based on the same system used in Spain, loyalty customers were sent a brief online questionnaire to evaluate the service received in the store. In the case of Argentina, face-to-face surveys were also conducted by supervisors, which complete the online version of these queries. These listening systems generate 40,000 monthly interviews, both online and face-to-face. In the first three months of this experience, more than 50,000 loyalty customers responded to the survey in Argentina, and these responses are sent to a committee in charge of passing on the conclusions to the different customer departments so they take action accordingly. In line with the strategy of increased closeness to customers and their needs, for many years the DIA Group has been developing different commercial communication and marketing actions aimed at the creation of a community of DIA customers that become involved and contribute their personal view of the business as well as areas for improvement. 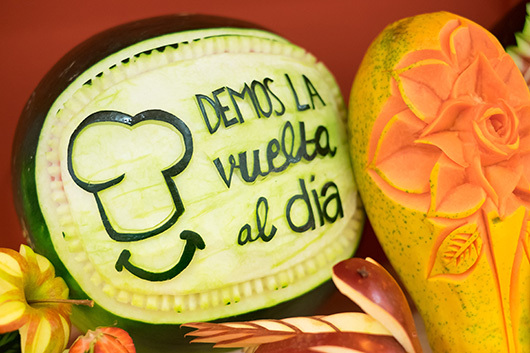 In Spain, the community of customers “Demos la vuelta al DIA” (Turn the DAY around) continued to bring those who enjoy cooking close to the world of gastronomy and food. Through this project, the company offers the possibly of participating in a cooking competition, attending free cooking courses, taking part in talks and tastings, visiting supplier factories, and receiving recipe packs with DIA products. In 2016, more than 450 events and cooking courses with some of the most prestigious chefs on the national culinary scene were held; more than 116,000 customers took part, and over 5,000 product prize packs were distributed. The different communication channels are essential for a direct relationship with the customer. DIA Spain has a customer magazine called “Club DIA”, which has a circulation of 700,000 copies. It provides useful content relating to food, new commercial items, recipes, and practical household tips. Argentina was the first country to create a community of customers for sharing information and exchanging experiences related to DIA’s business model. Under the name of “Expertas en Ahorro”, a community was founded in 2013 which, only three years later, has become quite an event in the country. In fact, at the close of 2016, the community of Experts in Savings had over three million loyalty customers who can benefit from different offers, attend events and cooking workshops or stay informed of the latest company news. In December 2016, Buenos Aires held the VI National Encounter of Experts in Savings, in which more than 3,200 people took part. As in the previous year, participants had to previously register on the DIA fan page in Argentina and make a donation in the form of a toy or book that the company then gave to the Fundación Sí and Fundación Manos en Acción of Argentina. Under the umbrella of “Expertas en Ahorro”, DIA Argentina has a weekly television programme called Expertas TV. The programme is broadcast through YouTube, where well-known figures get together to talk about new items, prepare recipes using DIA products, and provide savings-related advice. In 2016, the programme renewed its second season. As for Social Networks, in Argentina DIA has a significant community loyal to the business model with more than 1.7 million fans on Facebook, which is mainly supported by the different loyalty activities carried out in the Experts in Savings community and on its television channel. Likewise, DIA Argentina has a monthly magazine called “Expertas”, created with the same aim of getting closer to customers. The magazine has a circulation of 55,000 copies, covering various topics relating to family, health, style, shows, wellbeing, ecology, horoscopes, and pets, among others. The content is conceived and developed to suit the tastes and interests of its readers: housewives and professional women between the ages of 25 and 70. In 2016, DIA Brazil set up its own community of customers under the name of “Especialistas en Economía” where, as in Spain and Argentina, it holds courses, workshops, tastings, and other activities focusing on savings and raising awareness of products and the DIA model. In this first stage, 14 meetings of specialists were held in which 600 people participated. In total, more than 30,000 customers have already decided to join this new community in Brazil. Brazil also has a loyalty magazine “Revista DIA”, with a circulation of 10,000 copies that provides information about the different DIA product offers and company news. In 2016, it launched an application for both the iOS and Android systems, to make the digitalized magazine available on mobile devices. At the close of 2016, this application had been downloaded more than 25,000 times, making it the most downloaded application in the retail sector in Brazil. During 2016, China focused a large part of its efforts on two-way communication with digital customers. Taking advantage of the resources of the country’s most-used instant messaging application, WeChat, DIA has implemented different options that specifically seek this complementarity between the offline and online environments. The messaging application has a DIA application to find information about promotions, lifestyle, digital brochures, store locations and rapid access to the company’s e-commerce platform. In addition, China has a magazine aimed at customers called Club DIA Magazine, which is published twice a year (January and June), with a circulation of 200,000 copies. To further pursue direct contact with customers, DIA China conducts a satisfaction survey twice a year for loyalty customers regarding product range and store services. This direct and constant communication with the customer plays a significant role in the work carried out in the various social networks and commercial channels that the company has in all countries. Real-time information, issues relating to store functioning, and new product items are some of the topics most discussed through these channels, also helping to increase customer loyalty. In 2016, the DIA Group opened two new corporate channels, complementing the existing commercial channels, from which it provides institutional information, press releases and official communications in the company’s two official languages: Spanish and English. Accordingly, in January 2016 a new corporate profile was set up on Twitter, which serves as a communication channel with external agents and extends beyond customers to include the press, shareholders, investors, NGOs or government institutions, among others. 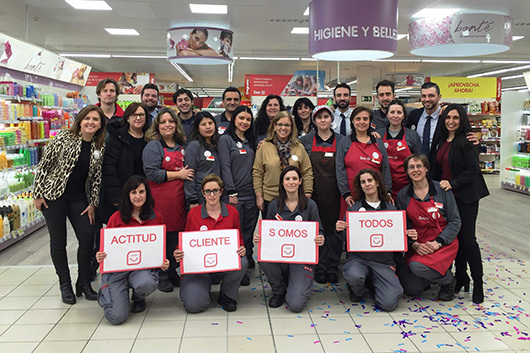 The Clarel chain of stores in Spain also has its own social networks, through which it organizes contests, offers beauty advice and receives feedback from its customers. The direct and permanent contact with consumers is completed with customer service. During financial year 2016, these services dealt with and analysed more than 113,000 requirements regarding matters relating to stores, products, opening hours, online service, etc. In order to make further inroads in terms of consumer relations, for the last 18 years the DIA Group has maintained a loyalty tool that allows it to know the needs, tastes and preferences of its customers and, consequently, the company organizes personalized offers adapted to their profiles. Club DIA is a tool used in relation to the company’s proximity concept, providing benefits to more than 37 million customers in all the countries in which the group operates. This loyalty system grants exclusive advantages to card users, while rewarding the frequency of its customers, allowing access to more than 250 products at reduced prices, bi-weekly promotions, and discount coupons that can take up to 50% off. Brazil has been the latest country where the company has a presence to implement the advantages of the Club DIA card. In 2016, it has been implemented throughout the territory of the state of Sao Paulo and now has more than 4 million loyalty customers. At present, 76% of the company’s total sales are made using the loyalty card, which makes Club DIA a fundamental tool in terms of business growth and consolidation. In spite of the differences and specific characteristics in consumption habits in the different countries in which the company operates, the Club DIA card continues to prove to be a valid and exportable model, gaining new members every year in the markets in which it is present. In this respect, it is worth mentioning the over one million new members in Spain and Argentina, as well as the 4 million in Brazil. At the close of 2016, more than 1.7 billion coupons were generated, compared to 1.65 billion in the previous year. In 2016, a large part of these coupons also began to be digitalised, for the purpose of completing the needs of customers increasingly accustomed to operating in this environment. This project has been started in Spain, with the issue of 46 million digital coupons at the close of the financial year. Getting closer to customers and gaining a better understanding of them involved staff at all levels of the company through the project known as “Proyecto Cliente”. This is a transversal plan aimed at enhancing the shopping experience of DIA customers, mainly focusing on two parameters: experience in establishments with the “Experiencia Cliente” project and involvement of employees at all levels through the “Actitud Cliente” project. Like all projects developed internally by the company, it has had an initial implementation stage and development in Spain, which is to be rolled out to the rest of the Group’s countries in subsequent years. For the implementation of the “Experiencia Cliente” project, during 2016 a qualitative study was carried out in Spain to identify the key points known as the Customer Journey; there was also a quantitative aspect to deal with prioritising these key points, differentiating between the formats in which the initial stage of the project began, DIA Market and DIA Maxi. To this end, more than 5,000 DIA customers were surveyed, along with 1,500 employees and 600 non-customers, defining a set of improvement initiatives associated with each group, elaborating a detailed file of each proposal to be implemented. Among the measures implemented in the store during 2016 to enhance this experience, note the strengthening of the bakery and fresh produce section, the installation of a public address system to improve communication with customers, more efficient restocking mechanisms, and the review of cash register protocols, among others. The initiatives developed as a result of the “Experiencia Cliente” project served in turn as a complement to another project focusing on improving customer experience and satisfaction, “Actitud Cliente”. This programme, initiated during the past financial year, seeks to improve the attitude and commitment of the group’s employees in terms of customer satisfaction through training workshops involving all staff, from top management to entry-level employees. In a first stage, reflection workshops were organized with national management, warehouses, stores and headquarters to foster customer-oriented behaviour and, in turn, define action plans for improvement. This gave rise to initiatives that are already being applied to improve employee involvement in customer satisfaction, such as thank-you cards for customers, recognition of people and teams of stores that provide a better service and telephone customer service protocol for all employees. In Spain alone, more than 14,400 training hours were given in 2016 as part of the “Actitud Cliente” project, benefiting 2,000 professionals of all profiles, from offices, warehouses, and stores. The implementation of third-party agreements to include services not seen up to now in the distribution sector have played a key role during the year. The objective is to bring customers closer to the concept of “total shopping”; in other words, have consumers satisfy their large purchasing needs in the group’s establishments. In September 2016, the DIA Group signed an agreement with the Dutch Bank ING, implementing a service that allows customers of the financial institution to withdraw cash in DIA’s store network throughout Spain. Through the Twyp Cash mobile application, users can request the withdrawal of a minimum of 20 euros and up to a maximum of 150 euros using their mobile devices at the cash registers of the DIA Group banners (DIA Market, DIA Maxi, La Plaza de DIA, Clarel and El Árbol), provided the transaction is always associated with a purchase. This service was gradually implemented from September, reaching nearly 2,900 own stores at the end of 2016. In the first four months of operation, more than 220 users registered to use this application. With this new service, DIA seeks to improve the customer’s shopping experience and make it easier for consumers who are not yet customers to use the extensive store network to withdraw cash. Likewise, this agreement makes it possible to take advantage of synergies with the rest of the digital services that DIA already offers, such as the application to manage shopping on smartphones or the use of digital coupons. 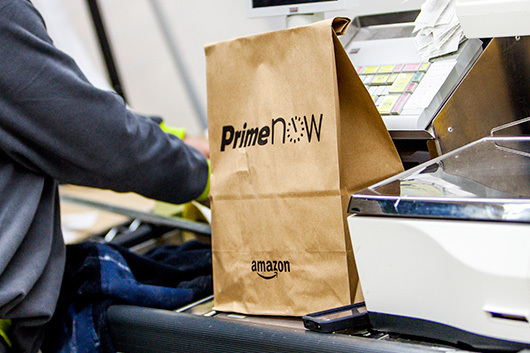 In September 2016, DIA also announced an agreement with Amazon whereby the La Plaza de DIA format would have an online platform on Amazon Prime Now. This provides DIA with a new sales channel within the world’s largest online sales platform, also taking advantage of the synergies arising from the joint activity between both companies. The virtual La Plaza de DIA store on Amazon Prime Now offers customers a total of 5,300 SKUs that can be received within one hour with the most premium service, or in two-hour delivery time slots for deliveries to Madrid. The product range includes all of the company’s own-label products: DIA for mass consumption products, Delicious for the Premium line, Bonté for personal care and hygiene, Baby Smile and Junior Smile for baby care and AS for pet food, in addition to fruit, vegetables, fish, and meat trays. At the close of 2016, and after only four months of activity, more than 40,000 orders had been delivered through this service. The effort the company has been making to make life increasingly easier for digital customers has also resulted in an agreement signed in Spain with Samsung, whereby it is now possible to pay in more than 2,200 own stores using the Samsung Pay application. This is a service using NFC (Near Field Communication) technology that enables payments from mobile devices quickly and easily at the cash register. This involves a mobile device payment service that is similar to the one that has been available since last year in all of DIA’s own stores in China. Using the WeChat platform, customers can make payments on mobile phones, using a payment procedure attached to a bank card, thus providing customers with a secure, quick, and efficient payment method.